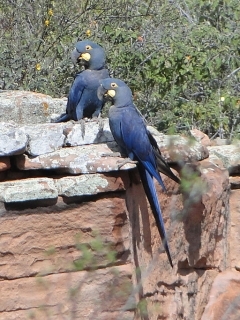 The Lear's Macaw is dependent on cliff-faces in gorges for nest sites. Both adults green wash on head and neck; upperparts purple/blue; body in general dark blue to purple/blue. Bill grey/black. Bare eye ring yellow, pale yellow teardrop shaped lappet at sides of lower beak, but not reaching beneath mandible. Eye dark brown. As in adult but with shorter tail and paler skin surrounding beak and eyes. Croaking and screeching sounds; weaker and higher pitched than Hyacinth Macaw. Article "Breeding the Lear's Macaw at the Al Wabra Wildlife Preservation," by Simon Bruslund Jensen, Ryan Watson and Dr. Sven Hammer, Australian Birdkeeper, June-July, 2007. Soaked or sprouted seed, walnuts, peanuts, pecans, Brazil nuts and pine nuts; fresh corn, cooked maize; fruits such as banana, oranges; nutritionally complete pellet for macaws. Large aviary with tree trunk in middle decorated weekly with fresh branches of pine, fir or eucalyptus, large chewable toys made for macaws, the more complex the better, also provide overhead misters for bathing. Not recorded but probably about 13 weeks. This species is threatened by habitat loss, hunting, and the wild bird trade. Confined to the Raso da Catarina plateau, NE Bahia, Brazil. Found in dry, rugged caatinga (thorn scrub) terrain. Mostly in areas with Syagrus coronata palms. Staple food item is Syagrus palm nuts; also fruits, agave flowers and maize. Liquid from unripe palm fruit is thought to be major source of moisture. Gregarious and in flocks. Roost in communes in weathered crevices near top of sandstone ravines. Leaves in groups to fly, foraging before dawn and returning at dusk. 2 or 3 eggs, 57.0 x 38.5 mm (2.2 x 1.5 in). February - April (wet season).